On the 6th May 2017 at the Nike Breaking2 Race in Monza Italy, Eluid Kipchoge set the record for the Worlds Fastest Marathon. Kipchoge ran the Marathon in a Record 2 hours 25 Seconds. He like many Others is the result of years of Application of Kenyan Running Training Principles initiated by experts such as the Great Renato Canova, Patrick Sang and Others. 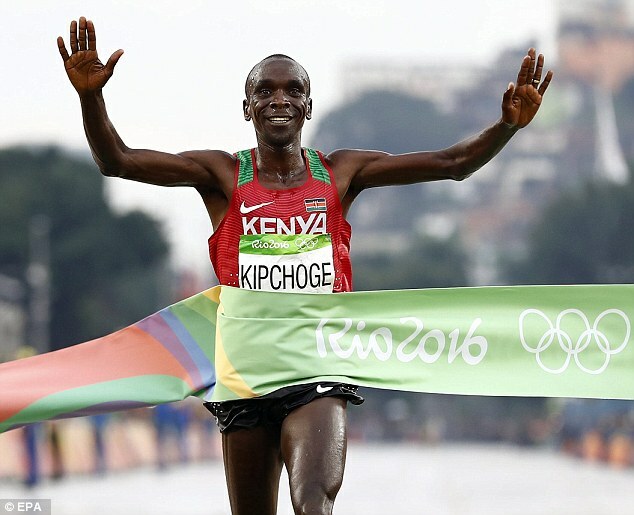 A typical day for Kipchoge begins with Warm Up Run around a 400m Track at never more than 8 Minutes Per Mile Pace. He and Other Athletes will then perform general Running related Stretches followed by Specific Stretching Movements prescribed by the Coach. They will then move on to specific Run related Stride work. The Running Group will then break into a Session such as the 2k-1k Drill. The Athletes will Run a "Repeat" of a 2K Run followed by 100m Walking Rest followed by another "Repeat" of 1k Run and another 100m Rest. This is repeated for 5 "Sets". Every Athlete will be given a Target Pace which they are expected to hit. Most of the Athletes can Run faster, but these Athletes don't break Records by wasting Energy when they don't have too. Once the Athletes finish the Run there is a Cool Down Mile at 10 Minute Mile Pace. Sometimes in the Morning depending on the Athlete they will do Double Sessions one 06:30 followed by Rest, and the next Session at 10:00. This can come in the form of a Regeneration Run before the Fartlek Session. A key Principle of Kenyan Running Training is keeping a Journal of Runs. Each Athlete has detailed Journals of every Run/Session they have ever done. The aim of this Post is to look into exactly what we learn from Kenyan Running Training for our own Running. Want to reach new Standards in your own Records? Read on to find out just what Kenyan Running Training can do for you. I will not be going too deep into the Science or Points such as Genetics. The aim is to present Tips, Techniques and Performance Methods you can use right now in Training for better Results. So take your Running Journal, and get ready for Notes. Every aspect of a Kenyan Runner Program is based of his or her Specific Race Pace Goals, Energy Thresholds and Previous Performances among other factors.This is why a Journal Personal to you is Essential,and if you're not keeping one you should be. Kenyan Running Training does not Involve Heart Rate Monitors, GPS or Technology to aid their Runs. One of the benefits of Journals is the development of "Body Feel". For Kenyan Runners the aim to feel a consistent Energy level through out the Race by being able to listen to their Body, and understanding their Energy Fluctuations. For your own Performance you should be recording aspects like:When you feel most fresh in Run? When do you feel Energy Levels start to drop? Can your Legs handle Higher Pace, and over what distance can you maintain it, What is my Anaerobic Threshold? You should then know for your own Race preparation. Once you become proficient in this it will be your Watch that will be your main Weapon. You will use this to Regulate your Kilometers, and plan your Pacing. Your aim here should be to know how you need to Pace yourself, Load your Training, know the effect of Training Progressions etc. Other Conditions can also be Noted such as your Mental State, Weather, Time of Day etc. Record all of the Effects these have on you. You Should also Record all of your Preparation for a Race or Session, Rest, Number of Hours Sleeping. The more Information you can gather the better. In order to Condition Leg Strength and Anaerobic Energy Systems Kenyan Running Training Schedules will always include one Session of Hill Running Per Week. Each Hill Sprint Session is of a One Hour duration, and they will be made of a varying distances depending on the stage of the Loading Cycle. Sessions Would starts by Building Up to 400m Sprints from 100m Sprints with "Reps" from 10-20. You want to do your Running in Blocks of 100m, 200m and 400m. Blood Lactate Levels remain Elevated up to 3 Days following a Competitive Run. This is where "Regeneration Runs" or "Flushing Runs" are applied. Before you can do this you need to know your Anaerobic Threshold(AnT) or Running Speed at Lactate Threshold. The Simple way to do this is to perform a simple test you can use on a Treadmill or Track. Perform this Test on a Day where you are Fresh as you will be doing a "Best Effort Run". Perform a warm up, and if using a Treadmill set the Incline to 1%. During your Warm Up you will gradually raise the Pace of the Run to one which you can keep up for around 30 Minutes. Once you hit that Pace you will maintain it for the full 30 Minutes. To obtain your RSLT you divide the Distance you covered in m by the Duration of the Run. So if you covered 8000m this would be 8000m/1,800Secs=4.5m Per Second. Then divide this by 400 meters which is 400/4.5=89 Secs to Cover 400m. Divide the number of m in Mile which is 1,609.34/400=4 now time this by the 400m Time equaling 4x1m 29 Secs =5 Minute 16 Second Mile Time. So your AnT is 5:16/mi.For your Regeneration Runs you would be working at -60%-70% of this figure, Calculated the Canova way this would be just over 6 Minutes 42 seconds at 6:42/mi. In keeping with the above Example this would mean instead of taking 30 minutes to cover 4.9mi to you would take 32 Minutes to Cover this Distance. You should also be stretching the distance at the slower pace up to 3 days after your Fast Run use a Long Slow Distance flushing which you can do at 60% this would work out at a Slower 7:13/mi. Although there these Times should be Calculated from your Specific Percentage there are many Elite Kenyan Runners who swear by the Rule of not breaking 8:00/Mi Pace on Regeneration Runs. Some 10:00/mi Pace Runs are not Uncommon. You don't have to use the Distance Covered that's an Example, but this should be Race Specific for you. One of the favored Methods used by Kenyan Runners is Long Run based entirely on target RP. This is normally at a Pace close to but not at RP.There are Two Types of Run which are used these are Long and Semi-Long Runs.Long Runs are Performed once every Two weeks at a Distance of 35km-45km, while the Semi-Long Runs are Performed in between 25km-30km.Now using the Information above lets say our Runner wants to run a RP of Sub-2 Hours. This means the Runner would have to hit 4:34/mile. On a Long Distance Day they would have to do a 40km Distance at a Pace of 4 Minutes 41 Seconds Per Mile. In Canova Method a Marathon Runner would do a 40K at 4:41/mile. You want to be including Runs at a Challenging Pace over Distance. This has been against some advise presented by other Sources, when it comes to Kenyan Running Training these are Essential. Although not true Intervals they are really "Repeats" theses are probably the most famous of the known methods, and have become known as Kenyan Intervals. They are known among the Kenyan Runners as "Lapping" Runs because they all take place on 400m Run Track. The are Shorter than Race Distance Runs designed to improve your Speed Endurance i.e How fast can you Run and how long for? As a result these Repeats tend to be Longer than normal Sprint Distances with Short Rest Periods One of the most consistently high Performing Runners of all time Catherine Ndereba or "Catherine the Great" is known for her use of what Kenyan Runners call "400s". She will perform a Session of 20-30 "Repeats" of 400s at a Pace of 71-72 Seconds per Run. Her Rest will be as little as 30 Seconds, and the simple Philosophy behind this is that there no Rest Periods in a Distance Run. These methods were the Core of her Training for the Bronze Medal she won in 2000 Olympic Games. These Sessions are simple, and can be done anywhere almost anytime of Year. Another staple Repeat Session used in Kenyan Running Training by some of the Fastest Runners is "1 to 1's" this is A session of 25 Repeats of 1 Minute Hard Running followed by 1 Minute Walking Rest. This a hard Session, but if you add this type of Training the Results are Guaranteed. Over longer Distances these Repeats take place over 1600m, 2000m and 3000m between 12km-20km Long. Another Core Method of Kenyan Running Training are Weekly Fartlek Sessions. These are normally no more than 50 Minutes at most. Fartlek means "Speed Play", and as the name suggests you will be manipulating your Speed. The Slow Run Periods are not strict Walking Rest Periods as in the Repeat Training Desribed above they are Slow Run Periods which a Slower Pace Per Mile is Maintained. The most Common one of these workouts being Similar to the above this Session uses the "1 to 1's" Ratio of Timing. You will Perform 10 Minutes of a Warm Up Run and go into 30 Continuous Minutes of 1 Minute Slow Runs with 1 Minute Fast Runs. If you don't see your last Meal again at least once while using this Workout you're not going at the right Intensity during your Hard Runs. Once you become more Experienced at this, and your Body is Conditioned for it then you can Progress the Slow/Fast Ratio. Start to Increase the work Load 1:2, 1:3,2:4 and so on all for the same 30 Minute Period of your Session. Theses Runs like Long Runs are based Primarily on Goal RP or Previous RP.Once per week as a key part of Kenyan Running Training you will perform a Tempo Run at Race Pace. These are all about extending your Capability at Race Pace as Opposed to the Long Runs described above. This will take the form of Distance Session performed at RP over a Standard Track where you can Time your Run. Most Tracks in Kenya are 16km-18km long for this Purpose. If you want to Block off your Time a Popular way to do it in Kenya is to use a Warm Up Run of 20 Minutes followed by a Hard 40 Minute Run. Again this will challenge your ability to keep a Meal Down if you're hitting your Pace. A lot of the Elite Runners will Run Tempo Runs from 45-75 Minutes. When building the Run times for Tempo Runs Less Well Conditioned or Novice athletes begin with 20 minutes at RP then move from there. In Kenya it is a Core Philosophy of Kenyan Running Training that these Sessions are Group Based and Runners will drop off at their Assigned Times which leaves the Elite Runners at the Head of the Pack to Run the Remaining Session. Running Coach Canova Credits these Runs as being the key to Kenyan Success. Advising that Race Type Specific Time Per Mile Training at RP should be a Core Method. Many Kenyan Coaches believe these Runs are the Single most Important Runs of your Program. Another way to perform these Runs which Kenyans use is to Run a Pace Faster than your RP for a Specific Number of km. This would be at a Pace 30-40 Seconds Faster than Race Pace. This would Gradually Increase from 2000m at the Faster Pace to 10.000m at the Faster Pace. It is quite likely that there have been times faster then Kipchoge's Marathon time Recorded by non-athletes in Kenya or Other African Nations. Once you've completed this Run it should Feel like you've just Run a Race. No Training Program would be complete without Diet and Rest. As with every other Training Program these are essential for Kenyan Running Training. The First Component Kenyan Runner will most closely Manage are the Sleep Patterns. Many are in bed by 21:00 and get 10 Hours Sleep. They will then Include Naps of a Minimum of Two Hours. The aim being to Build up hours of non-active and active rest. They may walk around camp or take Slow Walk. The Rule is at least one Day of Total Rest Per Week where there is as little Loading as Possible. This Same Philosophy on the Seriousness also applies to the mind. During these Rest Days of doing no activity Kenyan Runners will spend Time as Rule ensuring the Brain has Periods where it does not think about Running. This is Key for Full Regeneration along with the Combined Regeneration Runs. When it comes to Kenyan Running Training Rest really does mean "Total Rest". Diet has been featured as a Uniured que Factor of Kenyan Running Training being based on the Consumption of the Starchy Carbohydrates for example Ugali as the Core Energy Source. It has been put forward by some Sports Specialists that the World Running Community lags behind Kenya in fueling its Athletes. Most Elite Athletes will fall into the 5 Meal Per Day Pattern which is seen often with an Athletes Diet.However when on Camp there will be Food available at any time the Runners feel Hungry.Runners would always eat within 1 Hour of Training. As General Rule Nutrient intake Per Kilogram of Body Weight would be measured at 10.4g Carbohydrates,1.3g of Protein. Carbohydrates would be 75% of the Diet, Protein would be 12% of the Diet while Fat would be 13%. This is obviously well into the extreme for Normal Individuals, but due to levels of Training Kenyan Runners are able to process High Loads of Carbohydrates effectively. The Core Foods of the Kenyan Diet were Four Main Sources Ugali, White Sugar, Rice and Milk. These were supplemented with Bread, Potatoes,Beans, Cabbage,Eggs and a little Meat. The Majority of Fat and Protein in the Diet comes from Full Fat Milk. Athletes would add very small amounts of Beef. Just like the Majority of successful Nutritional Plans this one is based around a few repeated Staples and Dishes. Breakfast would be Tea, Full Fat Milk, White Sugar and Bread. Lunch would Ugali with Eggs or the One Portion of Beef. The Evening Meal would be another Helping of Ugali with one of the Other Foods Supplemented such as Beans. Where their Diet is different is the Large Consumption of Tea taken as above. The Kenyans would drink more of this than Water.Snacks would also be taken between meals maybe of Fruit or a Portion of Vegetables. So what does this mean for your Diet? Depending on your activity level there is no reason why you can't do similar. Ugali is not readily available in a many places, but for those than can get it they should use it. If not you can follow similar Guidelines. Workout your your Macro Nutrient demand from the above. Then follow your own daily amounts. However if you're not as active but still Running then you can follow Elements of the diet. Try Eating less Meat and taking Protein from Milk, Beans and Eggs. Add Tea with its Antioxidants to your diet, and you can even Enjoy it the Kenyan Way Post Race. For more information on Kenyan Running Training or have a Specific Distance Running Plan Designed for you then you can Contact Me Via this Site.